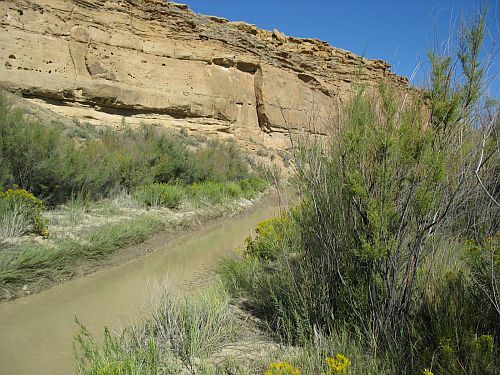 In my earlier post about Stephen Hall‘s recent paper reporting on maize pollen at Chaco Canyon dating as early as 2500 BC, I said briefly that this really shouldn’t be surprising to anyone who’s been following this kind of research closely, and also that I would discuss the context for it later. Basically, the context is that there has been a considerable amount of evidence accumulating in the past twenty years or so firmly placing maize in the Southwest much earlier than most archaeologists had previously thought. Much of this evidence has been gathered in a recent paper criticizing Jane Hill‘s arguments for the spread of maize having occurred as part of a migration of Uto-Aztecan speakers from Mesoamerica. The earliest directly dated maize seems to be from the Los Pozos site in the Tucson Basin, with a date range of 2860 to 2470 BC (this represents the calibrated 95% confidence interval, as do all subsequent radiocarbon dates in this post unless noted otherwise). According to the text of the paper, however, this date has been questioned, and the earliest uncontroversial direct date on maize comes from the aptly named Old Corn site near Zuni, with a range of 2460 to 2060 BC. 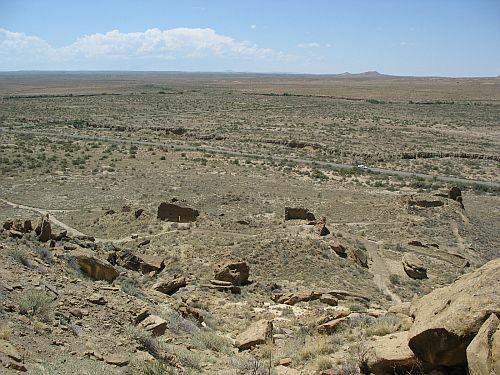 Note that the earliest date Hall found at Chaco (2567 to 2332 BC) has an upper bound slightly earlier than this, although the ranges overlap considerably. Similarly early dates occur at some Tucson Basin sites and at Three Fir Shelter in northern Arizona, although the Three Fir Shelter date has a particularly large confidence interval. The considerable geographic extent of these early maize dates implies that the initial introduction of maize to the Southwest may well have been quite a bit earlier than the earliest archaeological evidence for it. It also suggests that at least in most areas, with some possible exceptions such as the Tucson Basin, maize was initially integrated into a hunter-gatherer lifestyle without causing major changes to either the subsistence system or the social structure of the groups adopting it. This challenges many of the traditional assumptions about the effect of the introduction of agriculture on hunter-gatherer societies, including the idea that farming necessarily leads to an immediate shift to settled village life. There is little to no evidence in most areas of any such shift for thousands of years after the earliest evidence for maize agriculture, suggesting that the impetus for such a transition (which did indeed happen in almost all parts of the Southwest eventually) must be sought elsewhere. Okay, so there’s plenty of evidence for agriculture as early as the pollen dates at Chaco in many parts of the Southwest, but Chaco ain’t Tucson. 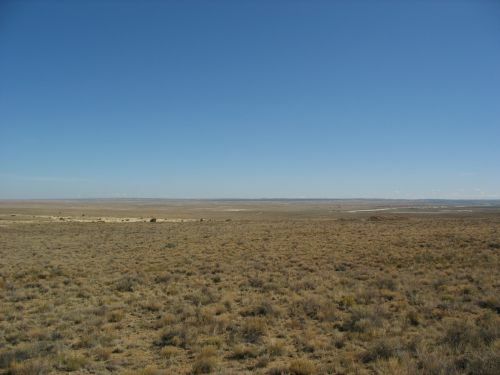 The high, dry, harsh environment of the central San Juan Basin seems particularly unsuitable for agriculture compared to a lot of the other areas with early evidence for maize. So surely this is a surprising finding at least for the local area, right? This very unexpected result led to a new project, known as the Chaco Shelters Project, to try to get more data on the Archaic period in the Chaco area through intensive study of the type of site most likely to contain well-preserved material: rockshelters. Two shelters were excavated, both outside of the park boundaries, one to the east (Sheep Camp Shelter) and one to the west (Ashislepah Shelter). Neither provided much in the way of artifacts, which was something of a disappointment, but both showed evidence of Archaic use, and Sheep Camp Shelter contained macrobotanical remains of both maize and squash. Neither contained maize (or squash) pollen. Both maize and squash remains were directly dated to the late Archaic. The squash results were more important, as the resulting dates were at the time the earliest evidence for the presence of squash in the Southwest. Despite the presence of these direct dates, the earliest dates Simmons had were on charcoal associated with the maize pollen at the ADAPT I sites, and these could potentially be questioned given the known problems with this kind of indirect dating. Now that Hall has come up with direct dates on the pollen itself which cover roughly the same timespan, however, Simmons’s indirect evidence looks more convincing than it may have at the time. 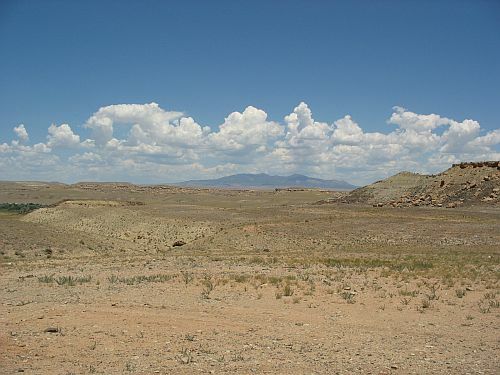 At the time Simmons was writing, there was much less direct evidence of Archaic agriculture in the Southwest than there is now, and the few reported early dates were problematic and disputed. He therefore has a substantial and quite useful discussion of the general issue in addition to reporting his specific data. He clearly comes down on the side advocating a gradual shift from hunting and gathering to agriculture, with maize being initially adopted by hunter-gatherers as part of a preexisting subsistence system and only becoming the primary means of subsistence considerably later. 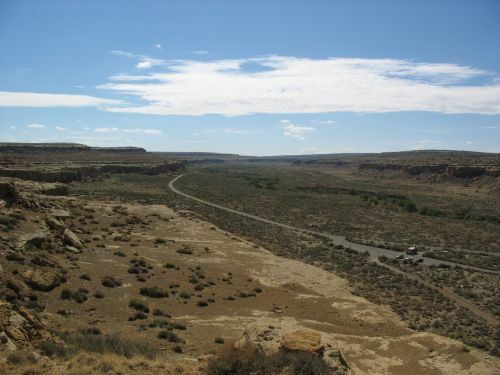 This view was generally associated with arguments for in situ development of Anasazi culture out of the local Archaic tradition, and was opposed by those who preferred to see agriculture as being introduced later and all at once, perhaps as part of a migration of agriculturalists from the south (a position now maintained by Jane Hill, among some others). 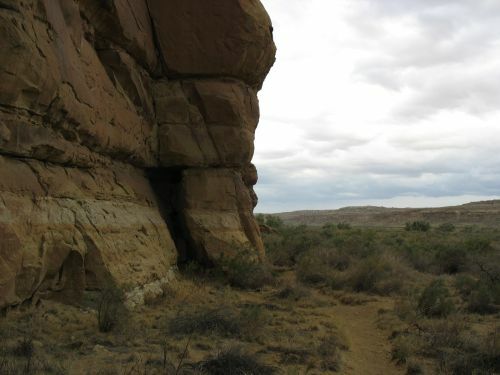 With regard to the Chaco area specifically, Simmons accounts for the differences between the open ADAPT I sites (with maize pollen but little macrobotanical evidence) and Sheep Camp Shelter (maize and squash macrofossils but no pollen) by proposing that maize was initially integrated into a subsistence system involving seasonal mobility, with spring and summer being spent in the ADAPT I area, where the many sand dunes would have fostered the growth of wild plants, and winter being spent in the more protected rockshelters in the canyons to the west. When maize and squash were added to the seasonal round, they would have been planted on or near the dunes in the spring, harvested in the fall, and taken back to the shelters to provide durable, storable food for the harsh and largely barren winter. He admits that the shelter evidence, especially, is a bit weak, as it doesn’t really support the idea of extensive winter use of the shelters, but there were apparently many Archaic sites near the shelters that may provide more support for occupation of the general area during the winter. He therefore concludes that the model he proposes is generally consistent with the data although more research is needed to confirm it. He mentions Atlatl Cave, in the park and excavated by the Chaco Project, as one possible additional data point in favor of his model. Hall’s new pollen data from within the canyon provides some support for Simmons’s model, especially in backing up the indirect dates with direct ones, but it also suggests some possible modifications to it. It clearly seems to indicate that the canyon itself as well as the dunes to the east was used to grow corn during the Archaic. This casts some doubt on Simmons’s proposal of seasonal mobility, at least in the way he frames it. 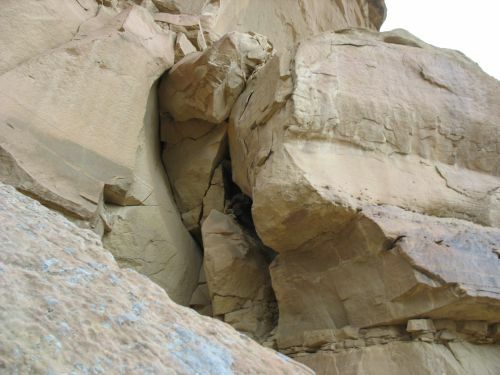 Growing corn in the canyon would imply occupation of it, perhaps in rockshelters such as Atlatl Cave, during the spring and summer in addition to (or instead of?) during the winter. That is, Simmons’s seasonal mobility model could perhaps be “condensed” into a similar model of subsistence activities throughout the year, but with year-round residential occupation in the canyon. People would presumably have still traveled around to gather resources in different areas at different times of year, but this would be “logistical” as opposed to “residential” mobility, with hunting and gathering parties setting out from a more permanent base camp solely to collect resources as opposed to moving the whole group to the location of the resources. It is of course also possible that Simmons’s model should be modified in some other way, keeping the seasonal mobility but changing the role of the canyon in it, but it’s hard to see where else in the area would have been more suitable for winter occupation. One of Simmons’s suggestions, that the advent of corn agriculture may have made the Chaco area an easier place to live by providing a fairly reliable food source in a place with limited and unreliable wild food resources, is particularly interesting. 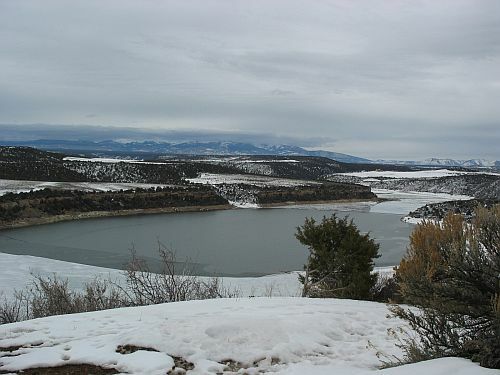 The San Juan Basin is well-known for its considerable Archaic population, which has generally been interpreted as indicating seasonal mobility and specialized adaptations to the region’s sparse resources, but what if that population was actually supported in part by incipient maize (and squash) agriculture? 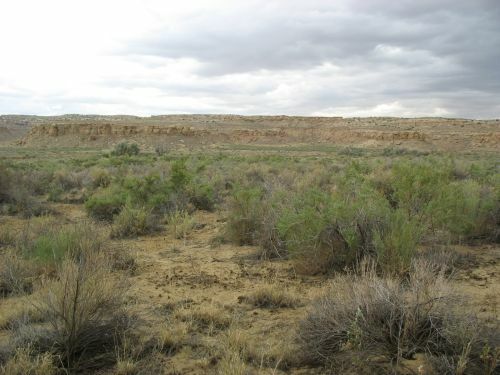 People often marvel at the apparent barrenness of the Chaco environment and the oddity of the idea that anyone would try to farm there, but this is another way to look at the harshness of the environment. To put it differently, farming in Chaco is certainly difficult and risky, but can you imagine trying to live there without farming? 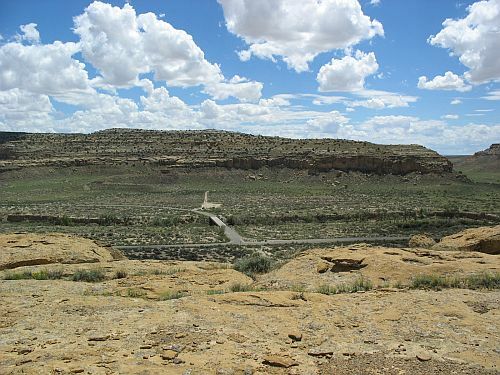 One important line of evidence in understanding the climatic history of Chaco Canyon, a subject of considerable interest given the harsh aridity of the current climate and the incongruous grandeur of the archaeological remains, has been the study of packrat middens. These are collections made by packrats of materials found near their nesting locations, which they collect and then seal with urine. The key thing about these middens, in addition to the preservation ensured by the protective coating of urine, is that the packrats have fairly small territories within which they collect material, so the contents of the middens, which can easily last for thousands of years, reflect the vegetation of the immediately surrounding area at the time the midden was created. Since they generally consist of organic material that can be radiocarbon dated, the middens can potentially offer enormous insight into climate change over time. There is some difficulty with this, however, because the proper interpretation of the contents of the middens is not always clear. Interpretations are often based on the visible plant remains (known as “macrofossils”), but these may be biased by behavioral factors owing to the diet and habits of the packrats themselves. Juniper, for example, tends to be overrepresented because it is one of the main components of the packrat diet. One way to avoid this problem is to look not just at the macrofossils but also at the pollen grains contained in the middens. Since these are too small for the packrats to be consciously choosing them, they would have to be deposited by wind or other natural processes, which may make them more reliable clues to the relative abundance of various plant species as opposed to the mere presence or absence of species. One researcher who has long been associated with this point of view is Steve Hall, who was for many years a professor of geography at the University of Texas. He is now retired and has a consulting firm in Santa Fe specializing in the geology of Southwestern archaeological sites. 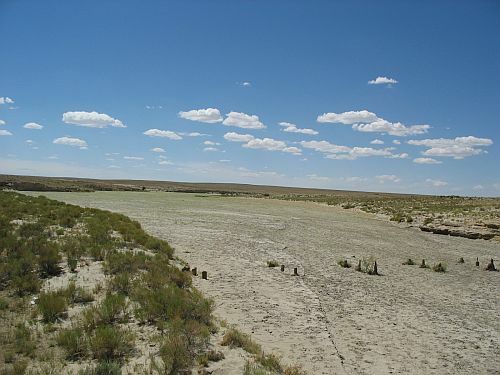 He has been involved with packrat midden studies at Chaco since the 1980s, and has recently published an important article reporting on a recent reanalysis of some of the middens that resulted in some remarkable conclusions. What Hall found in looking at the midden samples was corn pollen. This is not surprising in and of itself, since the Chacoans were of course an agricultural people with a corn-based subsistence strategy. The focus of the paper, however, is on radiocarbon dating of the pollen grains, which resulted in some remarkable findings. Conventional radiocarbon dating requires much larger samples than would be possible for pollen grains, but the relatively new accelerator mass spectrometry (AMS) technique requires only very small samples, and also tends to give more precise dates than traditional radiocarbon dating. Hall dated pollen samples from two packrat middens in crevices near Casa Chiquita, referred to as CC-2 and CC-3. 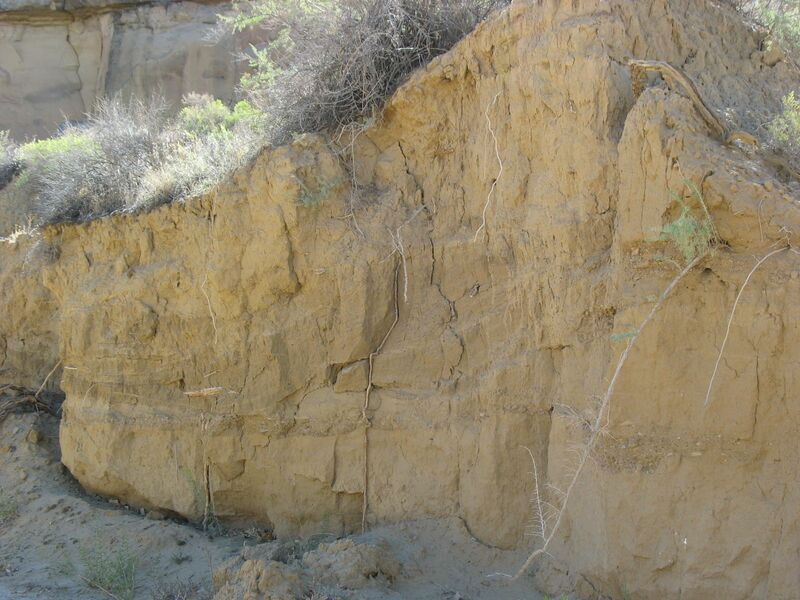 These are both right along what is now the “Petroglyph Trail” section of the Peñasco Blanco trail, and fragments of the middens can be seen from the trail, although they are now substantially broken up from sampling for study. 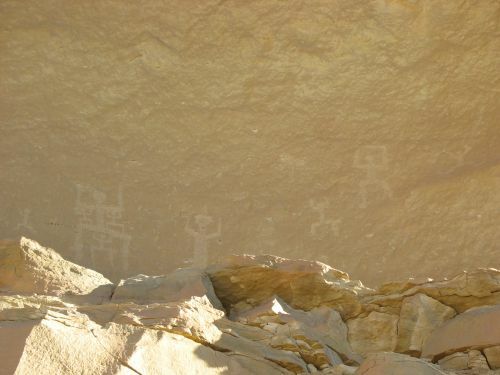 CC-3 is right beneath one of the best-known petroglyph panels on the trail. CC-2 is not as directly associated with any particular petroglyph panel, but it is in close proximity to a few. The results basically showed that the corn pollen was old. Some of the samples were very old indeed, on a par with the oldest known maize in the Southwest. The oldest sample, from CC-3, had a 95% probability of being from between 2567 and 2332 BC. Another sample, from CC-2, had a 95% confidence interval of 1457 to 1254 BC, while the rest of the samples from both middens were later but still pretty old, dating to the 800s through 400s BC. In addition to the AMS dating, Hall measured the abundance of maize pollen in the overall pollen samples from the middens and looked at the size of the pollen grains themselves. He found that maize pollen was quite abundant, and that the grains were consistently bigger than comparison samples of modern and later Chacoan maize pollen. Since maize pollen is pretty heavy in general, and this particular maize pollen was even heavier than usual, he concluded that it couldn’t have traveled far, and that it must have been blown into the crevices from a cornfield directly in front of them, where the packrats later incorporated it into their middens along with various other materials. One thing he points out in the article is that twigs from the same middens dated to much later than the pollen, which casts doubt on the common practice of dating middens only by single macrofossils. It seems that material incorporated into the middens can vary considerably in age, and direct AMS dating of pollen is a better approach to determining its age than dating of associated macrofossils. There’s a bit more to the article, but those are the highlights. This actually shouldn’t be all that surprising to anyone who has been following recent developments in the archaeology of the Archaic period in the Southwest, but I have not been, and I found it pretty surprising. After reading this paper I looked into earlier research a bit and found that there has been quite a bit of direct dating of maize and associated materials resulting in comparable dates, including some from rockshelters near Chaco. I knew that there was considerable evidence for early maize further south, in places like the Tucson area, but it seems that evidence for Archaic corn agriculture is pretty well established further north as well. The implications of this for Southwestern archaeology in general are therefore fairly limited, and it mostly just adds another data point to the accumulating evidence on Archaic agriculture. The implications for Chaco specifically, however, are huge. This shows pretty convincingly that agriculture in the canyon goes back to long before the main flourishing of the Chaco System in the eleventh and early twelfth centuries AD, and it suggests that Chaco’s importance may go back to thousands of years before that at least on some level. 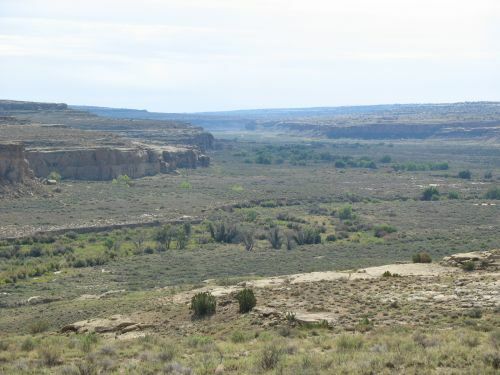 One interesting thing Hall points out is the proximity of these middens, and by implication the nearby cornfield, to Atlatl Cave, a well-known Archaic site on the mesa top about a kilometer away. The radiocarbon dates for Atlatl Cave match up pretty closely with the later dates on the corn pollen, and Hall suggests that the people who lived there were the same ones growing the corn in the canyon below. It’s a reasonable suggestion, and it puts a lot of interpretations of the early prehistory of Chaco in a new light. I’ll be reading up on the Archaic period and trying to understand what this discovery means for our understanding of Chaco during that time. I should have some more posts on the topic soon. For now, though, I’ll just note that this may indicate more continuity of occupation or at least cultural knowledge of Chaco than is generally assumed.